The distributors we work with are a key element in presenting our products in different areas of Spain, Portugal and France. Fill out the form and we will contact you to proceed to process the registration of your company as a Proder Distributor. 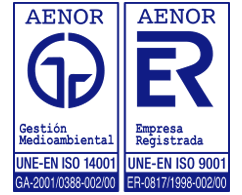 Since 1998 the total quality of PRODER has been certified according to the UNE-EN ISO 9001: 2000 standard with the number ER-0817/1998.